Gas Powered Stand-up Scooters with 33cc , 49cc , 50cc upto 196cc EPA Certified gas engines, choice of 2-speed, Electric or Pull-Starter Motorized Scooters. 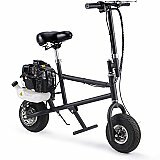 2-Stroke Gas Powered Scooters are the alternative low priced and fun transportation alternative of today, fuel-efficient and portable gas powered vehicles. We take pride in offering the most affordable, high quality gas powered scooter and Go-karts online. 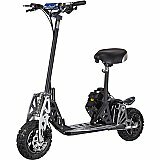 We only sell brand name stand up gas scooters from established gas scooters manufacturers with Scooter Replacement Parts and free warranty back-up. All of our gas powered scooters meet EPA regulations.